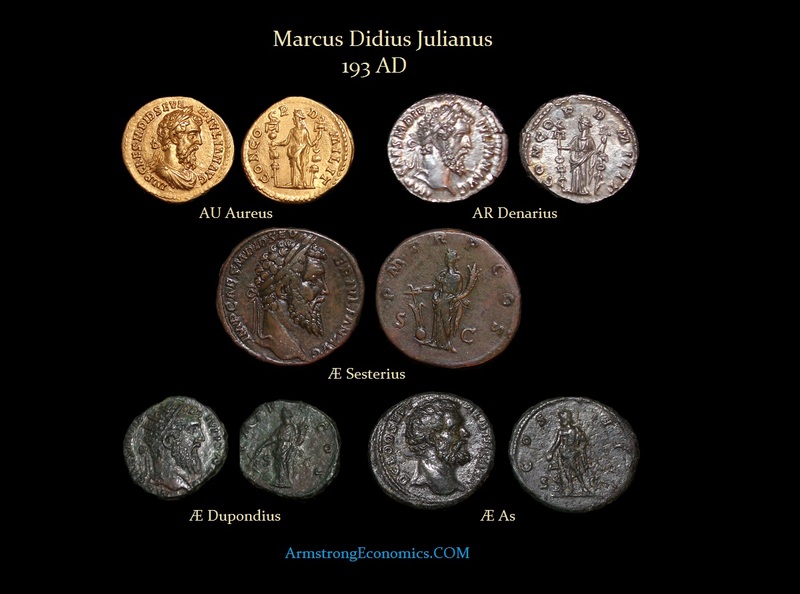 Marcus Didius Julianus was the son of Petronius Didius Severus of Milan while his mother was from Roman North Africa. Didius was raised in the household of Domitia Lucilla, the mother ofMarcus Aurelius, which served him well in political circles. In 172 AD, Didius was appointed commander of the XXII Legion in Germany. His career prospered and in 175 AD he shared a consulship with Pertinax. He also was Governor of four Roman provinces, which included regions of Africa up to Lower Germany. Didius eventually became a distinguished Senator of Rome by the time Pertinax came to power. Following the murder of Pertinax by the Praetorian guards, the full corruption of Rome burst forth. After parading around with the head of Pertinax on a pole, the Guards withdrew to the safety of their camp. No clear heir was available so the Guards stationed heralds on the wall to announce openly that the office of Emperor was up for sale to the highest bidder. Thus began perhaps the most scandalous affair in Roman history. The corruption had reached such levels that it was clear that the decline and fall of the Roman Empire began at this junction in time. There were two rival bidders who presented themselves – Titus Flavius Sulpicianus (father-in-law of Pertinax) and Marcus Didius Julianus. Didius’ bid was 25,000 sestertii per man, which was the high bid and he was duly declared Emperor. Didius Julianus quickly found himself in serious trouble. The treasury had been depleted much more so than he had expected under Commodus. Didius began to reduce the weight of the coinage trying to stretch the reserves as far as possible. At the same time, he attempted to politically demonstrate stability by also issuing coins baring the portraits of his wife Manlia Scantillaand daughter Pescennius Niger, the Ggovernor of Syria, to come to their assistance. Two other provincial Governors, Clodius Albinus in Britain and Septimius Severus in Upper Pannonia, were also determined to answer the appeal from Rome. Severus quickly advanced on Rome and Julianus, after several pointless attempts at negotiation with his rival, Julianus found himself deserted by the Praetorians and deposed by the Senate. He sought refuge in his deserted palace, but was beheaded on June 2nd after a reign of only 66 days. 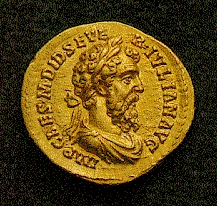 The weight standard under Didius Julianus was reduced most notably among the bronze denominations. The sesterius fell from an average weight of 25 grams under Commodus to 17-18 grams. The dupondius fell from 16-18 grams down to 11-13 grams. The gold suffered only a slight reduction in weight dropping from 7.5 to 6.5 grams on average while the denarius fell from 3.4 to 2.68 grams on average.